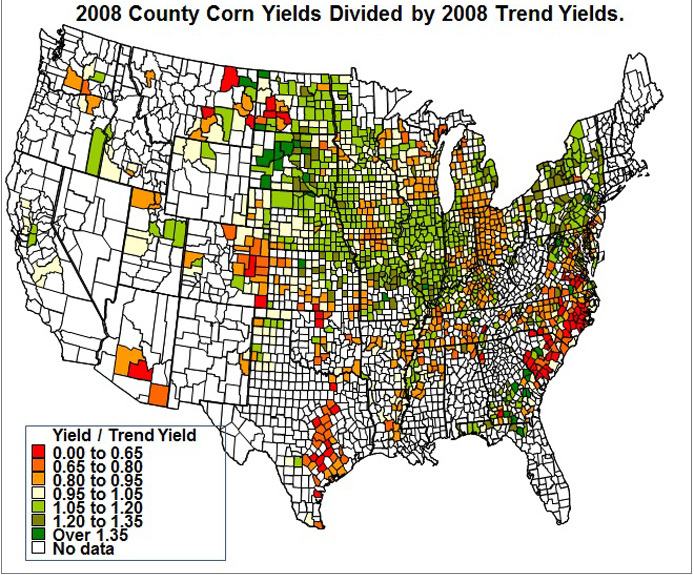 In 2013, counties in the eastern U.S. had corn yields above trend yields while the western corn-belt had below trend yields, resulting in a U.S. corn yield near trend. An evaluation of county yields for years between 2004 through 2013 suggests that corn yields have to be above average across the vast majority of the corn-belt counties for the U.S. to have a corn yield significantly above trend. Similarly, county yields in the majority of corn-belt counties have to be below average for the U.S. yield to be significantly below trend. In this post, county yields are compared to trend yields. Trend yields for 2013 were found by fitting a linear trend line through data from 1972 to 2012 using regression methods. The linear trend then was extended into 2013 to find the 2013 trend yield. The 2013 trend yields represent expected yields for 2013. 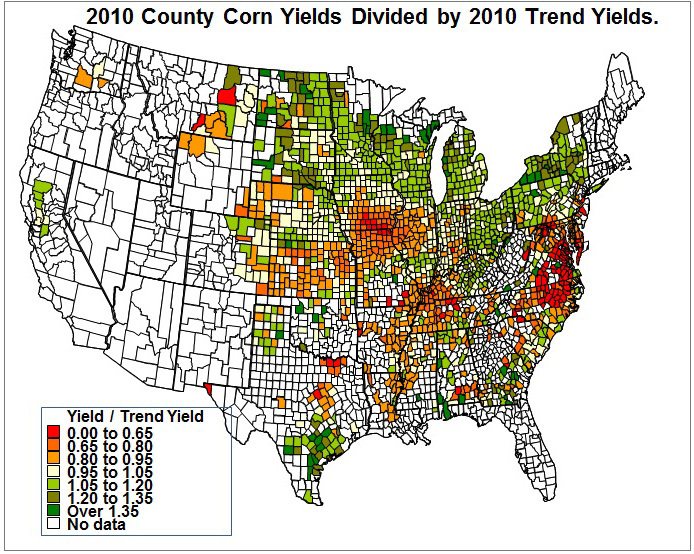 For example, DeKalb County, Illinois had a 2013 trend yield of 179 bushels per acre. Given “normal” weather and other growing conditions, the yield in DeKalb County was expected to be 179 bushels in 2013. 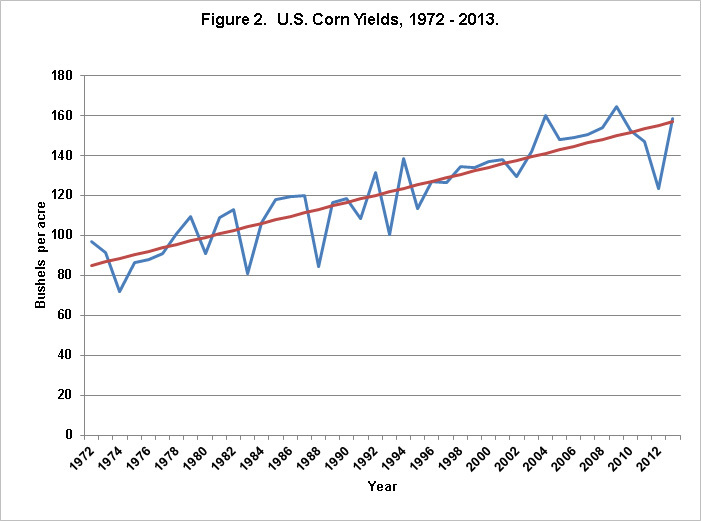 The actual DeKalb County yield of 194 bushels per acre was above the 2013 trend yield. 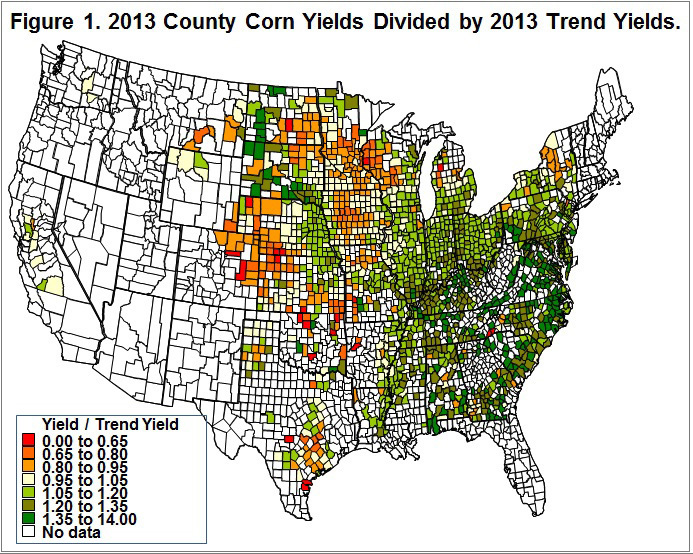 Figure 1 shows 2013 yields divided by 2013 trend yields. The 2013 DeKalb county yield of 194 was divided by the 2013 trend yield of 179 to result in 1.08, meaning that the 2013 yield was 8% higher than the expected yield. Values above 1 indicate that yields were above expected levels. Values below 1 indicate that yields were below expected levels. With notable exceptions in northwest Wisconsin, central Michigan, northern New York, most counties east of the Mississippi River had above trend yields. The eastern corn-belt encompassing Illinois, Indiana, and Ohio had above trend yields, with some counties in Indiana and western Ohio having yields 20% above tend. 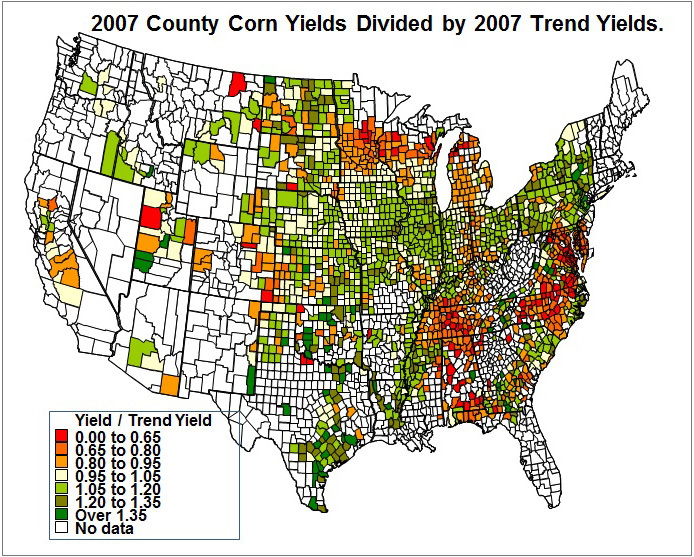 Much of the south and eastern seaboard also had above trend yields. 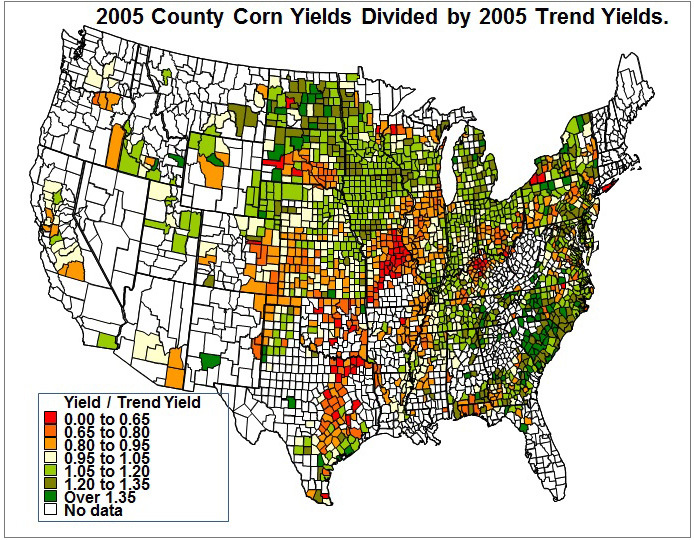 With the exception of eastern Nebraska, much of the western corn-belt had below trend yields. Many counties in central and northern Iowa, southern Minnesota, eastern South Dakota, and eastern North Dakota had yields more than 5% below trend. 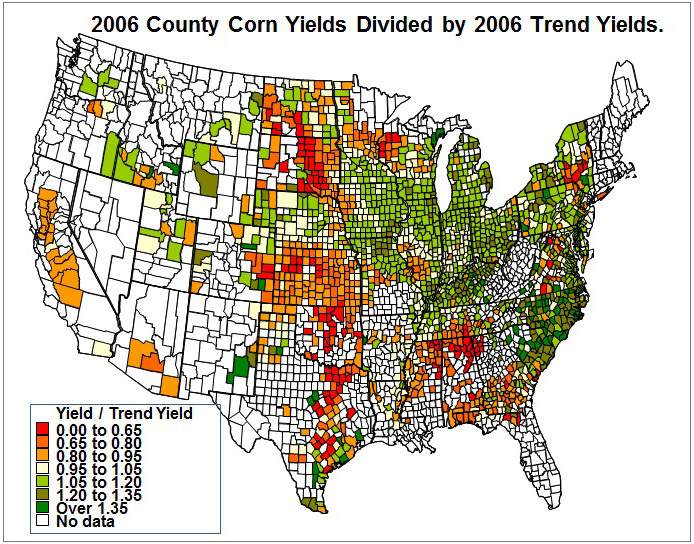 The above trend yields in the east offset the below trend yields in the western corn-belt, resulting in a U.S. corn yield close to the 2013 trend yield (see Figure 2). The 2013 U.S. corn yield was 158.8 bushel per acre, about 2 bushels higher than the 157.1 trend yield. U.S. corn yield have not been significantly above trend for a while. Within the last ten years, the U.S. corn yield has been 8 bushels above trend in two years: 2004 and 2009. Length of time between high yields does not hold implications for actual yields in 2014. U.S. yields in any given year for corn are not depended on yields in the previous year. Stated alternatively, the probability of a significantly above average yield does not increase with the length of time since an above average yield has happened. However, previous yields do provide some indications of the geographical conditions for significantly above average U.S. corn yields. 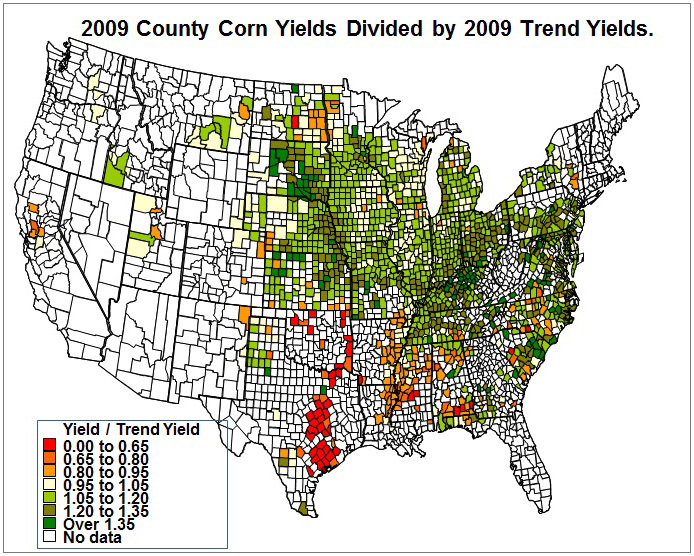 When an above trend corn yield occurs in the United States — such as those that occurred in 2004 and 2009 — the vast majority of counties within the corn-belt have an above average yield. Similarly, for the U.S. corn yield to be significantly below trend, the majority of counties within the corn-belt have to be below trend. If there are some counties in the corn-belt that are above trend while another area has below trend yields, the U.S. corn yield generally is closer to trend. A brief review of the past ten years demonstrates these relationships, with the maps at the end of this post illustrating the points. 2013: The U.S. corn yield was 2 bushel above trend. Above average county yields in the eastern corn-belt were offset by below average yields in the western corn-belt. 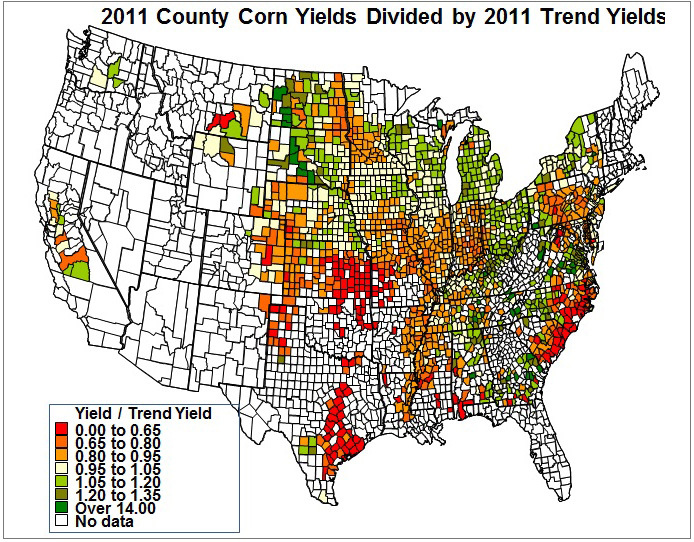 2012: The U.S. corn yield was 32 bushels below trend. With the exception of eastern North Dakota, most counties in the corn-belt were significantly below trend. 2011: The U.S. corn yield was 6 bushels below trend. Yields were below average in Indiana, Illinois, southern Iowa, and Minnesota. Western Ohio, northeast Iowa, and eastern Nebraska had counties with above trend yields. 2010. The U.S. corn yield was 1 bushel above trend. Yields were below trend in western and central Illinois and southern Iowa. 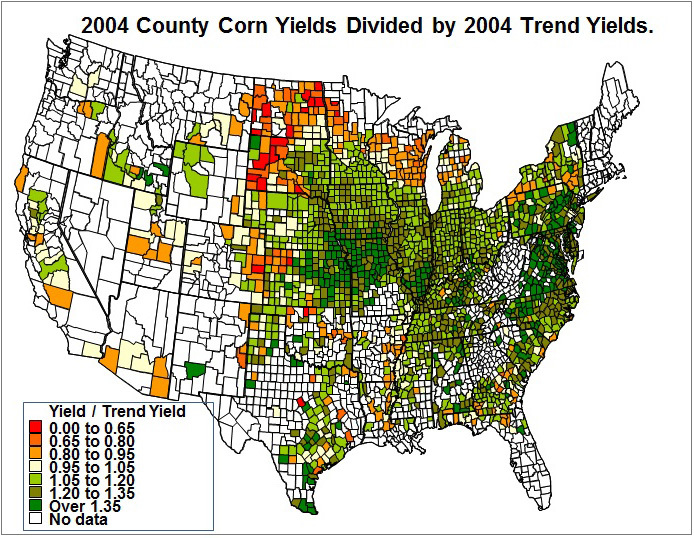 Most other areas in the corn-belt had yields at or above trend. 2009. The U.S. corn yield was 15 bushels above trend. 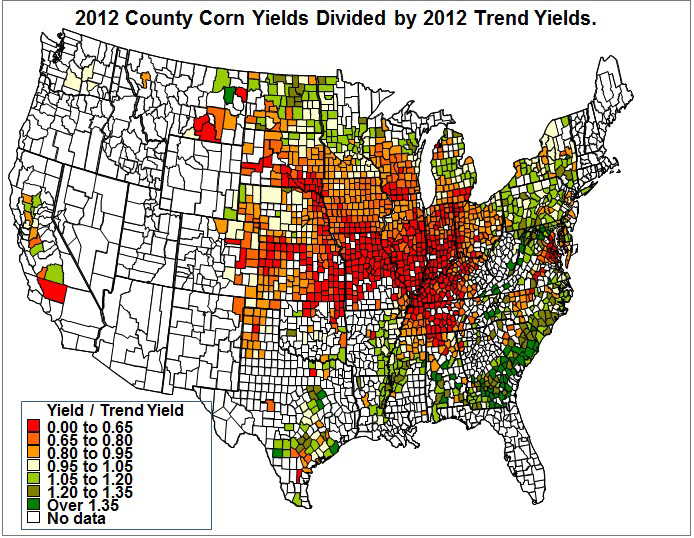 Yields were above average in the vast majority of counties in the corn-belt. Some exceptions exist in eastern North Dakota and scattered other counties. 2008. The U.S. corn yield was 6 bushels above trend. Yields were below average in Ohio, eastern Indiana, and central Iowa. Yields were above average in Illinois, western Indiana, southern Minnesota, and Nebraska. 2007. The U.S. corn yield was 4 bushel above trend. Yields were below trend in Minnesota and along the Ohio-Indiana boarder. Yields were above trend in Illinois and eastern Iowa, Nebraska and the eastern Dakotas. 2006. The U.S. corn yield was 4 bushels above trend. Yields were below average in central Minnesota, western Iowa, southwest Illinois, and the Dakotas, and eastern Nebraska. Yields were above trend in eastern Iowa, northern Illinois, Indiana, and western Iowa. 2004. The U.S. corn yield was 19 bushels above trend. With the exception of some counties in eastern North Dakota, yields were above average in the entire corn-belt. For the U.S. to have an average national yield significantly above trend, the majority of county yields must be above trend yields. Similarly, for the U.S. to have an average national yield significantly below trend, the majority of counties in the corn-belt must be below trend. When some counties in the corn-belt have above trend yields and others have below trend yields, the U.S. yield typically is close to trend. For exceptionally high and exceptional low U.S. yields, larges weather patterns must impact the Midwest with either good or poor growing conditions. If weather is more diffuse across the Midwest – with some areas having good conditions and other poorer growing conditions – the U.S. yield will be closer to trend.